The Beck Group used Building Information Modeling (BIM) to help the Seoul-based SaRang Community Church maximize use of the site for its 45,000 weekly worshippers by extending the building's usable space 120 feet underground. Its innovative design also included 2 mammoth curving glass and steel towers connected by a sky bridge. The slope of the building meant small changes impacted every floor. 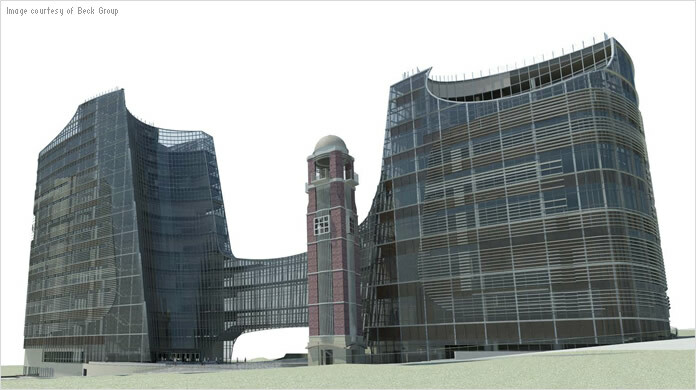 BIM software enabled 100 iterations of the curvature to find the design that best suited the site and the client. Using the intelligent model, the team adjusted the building shape with massing tools to achieve an elliptical effect with flat glass—saving 1,000 hours of design time and at least US$1 million. Horizontal sunshades may be the norm, but energy analysis tools helped the team demonstrate the superiority of vertical shading—which not only proved more efficient, but harmonized better with the exterior.